Your contact center sits at the heart of your company’s customer support processes. This means running an organized, effective contact center is vital if you want to deliver top-notch customer service and inspire long-term loyalty. 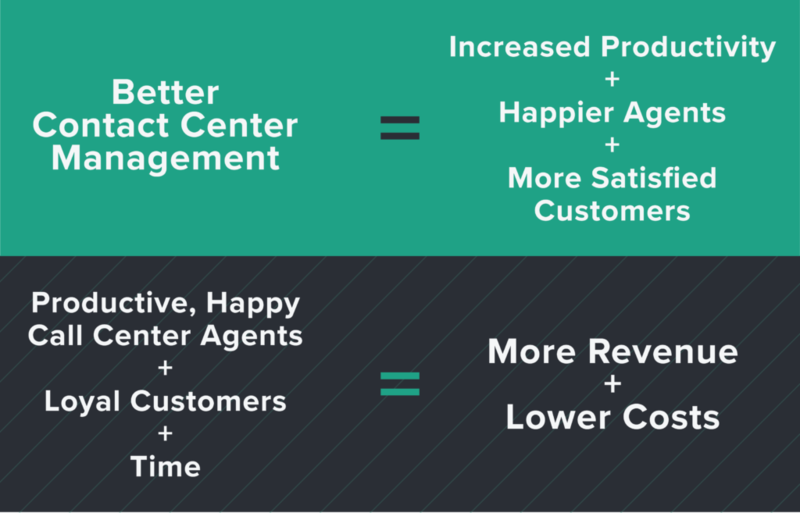 Contact center operations involves duties and roles ranging from day-to-day management and troubleshooting to big-picture decisions on how to measure agent performance and track customer satisfaction levels. The primary goal of these operations is to ensure the call center runs as smoothly as possible, so you can optimize productivity, efficiency, and customer satisfaction. Where Can You Find Information on Everything Related to Contact Center Operations? Since call center management has so many moving parts, it would be almost impossible to cover every aspect of it in a single resource. That’s why we put together this collection of our favorite articles and resources on everything involved in contact center operations. Whether you’re new to call center operations, looking to break into the industry, or considering shaking things up at your current contact center, sometimes you just need to go back to basics. These first two articles are must-reads for anyone who wants to brush up on the foundations of running a successful, functioning contact center. This piece is geared towards call center agents, contact center managers, outbound sales reps, and sales managers. However, the advice here is relevant to anyone looking to improve their customer service or sales skills. By discussing what typical call center operations involve, team structure and roles, and best practices for both inbound and outbound calls, this article provides a well-rounded introduction to contact center basics. There’s also a section on recommended phrases, language to avoid, and how to diffuse a difficult situation with an angry caller. One of the key takeaways is that customer satisfaction, agent performance, and measurable results should be the biggest drivers behind how your run your call center. Try to make decisions and changes after close reflection on these aspects of your operation. Perhaps the most important message from this piece is that the best call center operations strategies strike a balance between speed (efficient support) and quality (top-notch customer service). This easy-to-digest blog post touches on six key pillars of contact center operations: location, customer service, technology, processes, agents, and finance management. It includes advice for how to measure customer satisfaction, including which metrics to consider tracking. A solid call center process requires understanding the customer journey from point-of-contact to resolution, so this article makes a case for “mystery shopping” you own call center by phoning in and posing as a customer. This allows you to experience the entire journey from the customer’s perspective. The biggest takeaway? Planning, measuring, and optimizing contact center operations is always a bit of a juggling act. You’ll get the best results by focusing on customer experiences without going over budget or running down your best staff members. It’s almost always worth investing in better management techniques. The more smoothly your call center operates, the more productive and positive your team will be on the job – which means callers will receive even better customer experiences. In turn, your productive, happy call center agents will inspire customer loyalty that decreases churn, increases efficiency, and boosts revenue over time. Check out these next four articles for tips on perfecting your management style. This article discusses the day-to-day challenges of contact center management as well as the skills and experience required to excel in this type of role. Since the major points are chunked into four sections related to specific call center challenges – along with the tools and strategies you need to overcome them – it’s easy to skim quickly for the information most relevant to you. Knowledge of industry trends, emerging technology (like chatbots, omnichannel support, and the role of AI), and the day-to-day happenings of the contact center (including performance, progression towards company goals, and customer satisfaction). Access to the right technology. This might include technology monitoring and omnichannel support tools that give agents real-time access to customer history, so they can provide personalized, effective support. Benchmarks and KPIs to base decisions on when making changes to the call center processes or operations. Once you have tech monitoring and call monitoring in place, it’s much easier to make these data-driven decisions. An understanding of why and how to empower contact center agents. This means recognizing the importance of employee empowerment and delegating responsibilities to different members of your team. These best practices include guidelines to help you hire the right talent, reduce employee turnover, and deliver better customer experiences. For example, it discusses how to ensure your hiring and evaluation processes are helping build a strong team of agents committed to your brand and values. The article also reviews the type of language that’s most appropriate for contact center agents, how to train new employees, and how to motivate your team members with a defined career path to move up through the ranks at your company. One thing that many other resources overlook is the importance of creating a work environment that reflects the type of performance you expect of your agents. That is, your physical call center should be conducive to productivity. This could mean standing desks and ergonomic keyboards or calming office designs that allows agents to remain both focused and comfortable. Think: natural lighting, plants, warm colors, air conditioning, and the ability to switch between desks as necessary. An extensive collection of insights shared by call center management experts, this piece touches on everything from workforce management to customer satisfaction to which KPIs you need to track. This includes advice on hiring and training a stellar team of contact center agents, general workforce management, and scheduling tips. It also provides insights on trends in customer service, tips for choosing contact center technology, and motivating your team members to perform their very best. So, whether you’re new to contact center management or looking to break into a leadership role, there’s plenty of knowledge to be gleaned from these tips. This resource will help make sense of your existing contact center operations. It will help you determine whether your current approach is sustainable (both in terms of service quality and ROI) or is in need of a reboot. The author does an awesome job breaking down the top cost drivers of contact center management (contact volume, handle time, human resource costs, and telecommunications costs) and provides guidelines on how to cut back on those expenses. More specifically, the section on controlling costs offers tips for delivering big results on a smaller budget. This includes time-saving tips, metrics to track, and clever cost-cutting measures that won’t sacrifice customer satisfaction. Not to mention the detailed writeups on monitoring call quality, processes, and performance; call calibration and integrated voice response; and tips for disaster recovery. If you’re aiming to upgrade your call center operations from alright to awesome, you’ll want to bookmark the following two resources. Both are written for managers who want to change their approach to contact center operations for the better. Even once you decide that your call center operations need an update, it can be hard to decide where and how to get started. In this article, the author draws from their first-hand experience in revamping their company’s contact center operations. The process involved benchmarking their processes and procedures against world-class call centers, optimizing resource management, and increasing call routing efficiency. Customer research is invaluable and should inform all call center decisions. Receive and analyze feedback first; then adjust your operations accordingly. Be deliberate in your use of resources (including time, budget, and agents). Keeping up with modern contact center technology and trends means constantly adapting your operations strategy. Conducting regular A/B testing to fine-tune your customer service experience. Collecting agent feedback on everything from call center processes to training to workplace culture. Encouraging dialogue between team leaders and agents to brainstorm creative solutions to ongoing issues. Ensuring you have a crisis management and disaster recovery plan in place. This means preparing your team to handle service disruptions caused by crashes, weather, and cyber-attacks. When you get right down to it, contact center operations best practices vary from company to company. What works best for you may not work quite as well for a competitor. So, check out the resources above and try out some of their recommendations, but don’t be afraid to tweak your processes to meet the specific needs, goals, and structure of your contact center. Above all, make sure your agents have all the tools and training they need to succeed – including the right technology and tools to deliver fantastic customer support. Need more hands-on help with your contact center operations? Get in touch with our team today to find out how Relay’s intelligent support software can help you deliver amazing customer experiences! Sign up for our newsletter and get our best posts delivered to your inbox once per month.